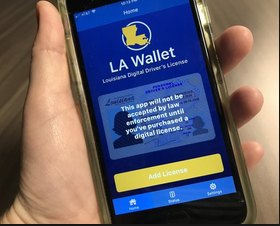 Louisiana’s digital driver’s license app can now be used as identification for making adult purchases. The office of alcohol and tobacco control says it’s now authorizing use of the “LA Wallet” to buy beer, liquor and cigarettes. The app was launched last summer and allows users to carry a digital driver’s license. Nola.com reports that despite the new rule, retailers retain the right to ask for physical identification.